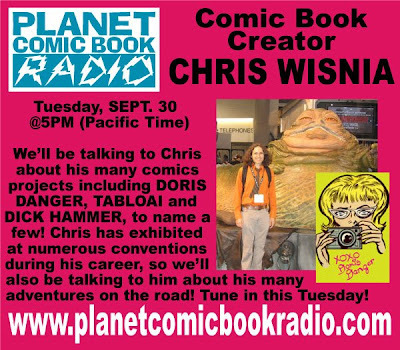 My guest on Tuesday, Sept. 30 will be cartoonist CHRIS WISNIA. Chris is someone I've run into numerous times over the years at conventions, and this man's work is pretty dang funny. Please tune in and join us for the interview! 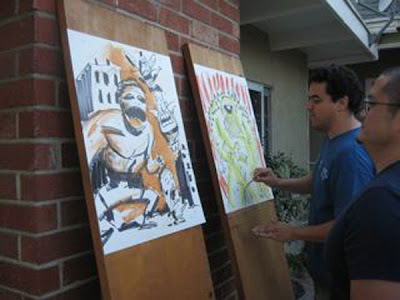 On Sunday, several of us Cartoonistas were at Co-Founder JIM LUJAN's home training in his no-hold-barred Live Art Bootcamp! Several of the Cartoonistas will be participating in the Nuvein Foundation's 3rd Annual Gala on Saturday, Oct 4, in El Monte, CA. We'll be providing an evening of Live Art. 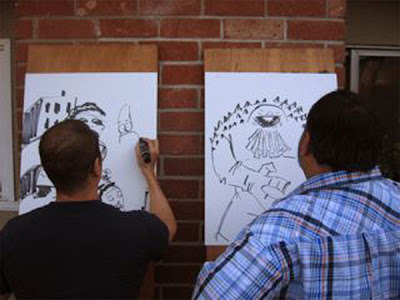 And since some of us (me included) never actually performed Live Art, we figured Jimmy outta whip us into shape! Obviously, every time I've drawn over the last umpteen decades (!) has been 'live art'. 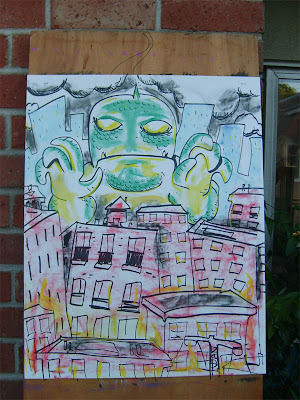 But I wanted to get a feel for drawing on a large sheet, in a limited time, and being as spontaneous as possible. We have two shifts for our performance, and limited time, so practicing some speed drawings can't hurt. I decided to start the evening off with my little baby, the Man-Swamp! I wasn't too happy with it, as it looked too empty and skimpy. But, never fear, here comes Jim Lujan and his Magic Chalk! Man-Swamp and Jimmy...two great tastes that go great together! Ted surveying his artwork with the eyes of a stern critic! 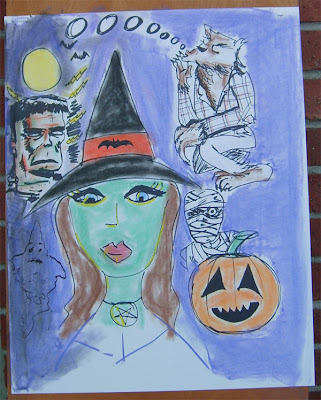 A Halloween art jam started by Grasiela Rodriguez. Didn't take long for the rest of us to jump on that like flies on....ice cream??! 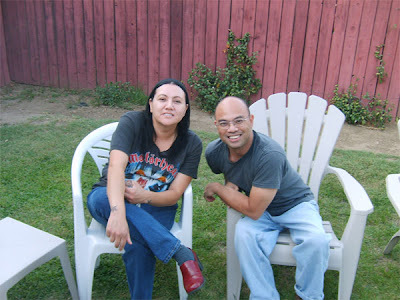 Grasiela taking a break to shoot the breeze with Renato Aguirre. 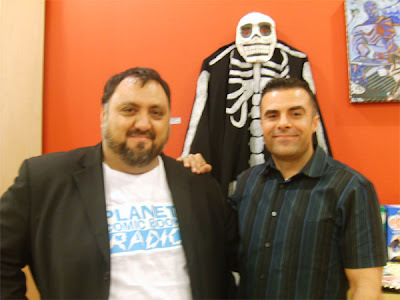 Renato is my fellow producer on Planet Comic Book Radio, and is also a Board Member of the Nuvein Foundation. 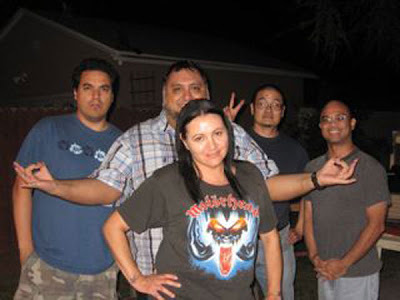 Nuvein is a literacy and arts advocacy group in the San Gabriel Valley, and provides support to PCBR. I've been on the Marketing Committee of Nuvein since December of last year, and in fact was just nominated to join the Board! A great honor, of course, but can someone please clone me?! I busted out this piece in a flash of inspiration. Going back to my Undead Mariachi roots! Jim's done live art before (sharing stages with James Kolchaka, Lea Hernandez and James O'Barr) so he was in his element here. Actually, his art style lends itself to live art. He rips through a drawing (finished a mini comic recently over two lunch breaks!!) and creates it with real live, kinetic energy. 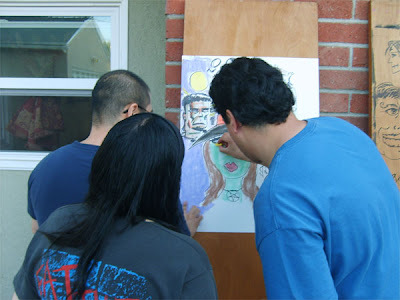 One of the reasons he told me he wanted to start the Cartoonistas group was to build a following as a Live Art group here in the San Gabriel Valley. I'm glad that we're about to perform our first Live Art event as a group, and we've already lined up another gig at a local library in at the end of October. Followed by that dramatic, apocalyptic stage lighting he's known for!! Take that, CLOVERFIELD!! Amongst all the great art and the fun, geek talk, we stuffed our faces with Pizza and soda pop, candy and chips, and a couple of toasts of the bubbly! That's what I call boot camp! 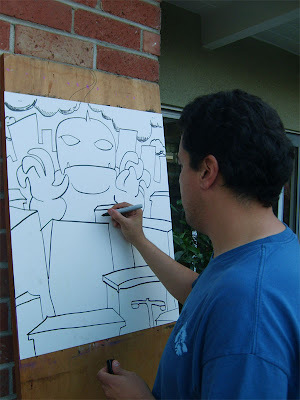 Check out Jim's pix at the CARTOONISTAS site! 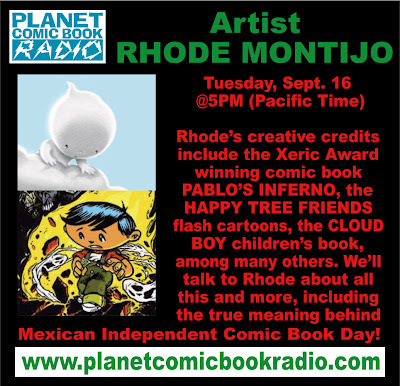 My interview with artist RHODE MONTIJO is now available at the PLANET COMIC BOOK RADIO site. 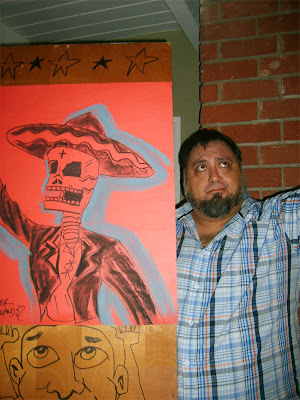 I've known Rhode for as 11 years, having met him at a comic book convention a year before I first published EL MUERTO. In that time, we have both been great supporters of one another's work, and I consider him one of my best friends. 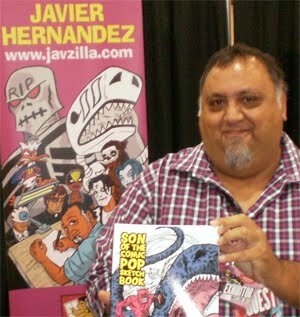 His amazing creativity has been wonderful to watch over the years, crossing over from comics, web cartoons and now children's books. He's always up for adventure and lives life to the fullest. Once, when we were working on the post-production for the EL MUERTO movie, he happened to have been in the Burbank area and joined us for some audio looping! I can't tell for sure that his background voice work made it onto the final recording, but at least his EL MUERTO painting made it to the Guest Artist gallery on the EL MUERTO DVD. Check out the interview, and get a portrait of an artist who puts all his passion into his art, and a healthy sense of optimism. In other podcasting news, the second episode of my other show, the bi-weekly JAVILAND, is now available for download. In this episode, the topic was 'Creating Comic Book Characters', and the discussion focused on what we create first: The character or the story. I was joined by three other cartoonists and we had a good, varied discussion on the topic. 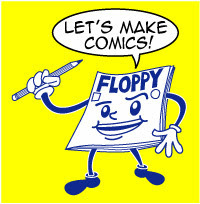 That's the objective of JAVILAND: to discuss with other creators topics relating to the creation and publishing of our own comic books. And the final 'media alerts' I have for this entry is the news that the cable access tv interview me and my fellow CARTOONISTAS filmed a few weeks back is now available to watch! It's posted on the CARTOONISTAS site here. Now back to work...! 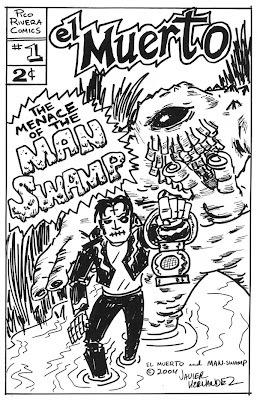 Get ready for my upcoming mini-comic...The MAN-SWAMP!!! 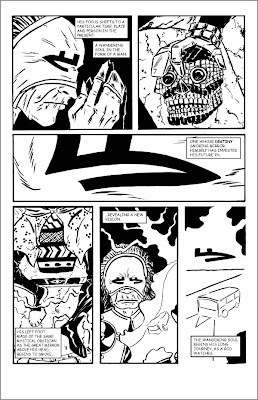 Okay, I have a new EL MUERTO comic coming out in November. I'm also premiering my new character, DEMOLITION DOVE in early 2009 under the XOMIX COMIX imprint. 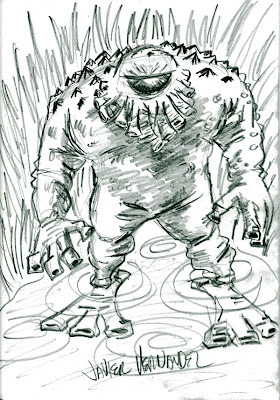 Man-Swamp started out as a gag idea, more or less. 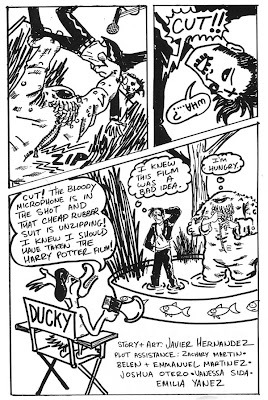 An homage to the legendary swamp monsters in film and comics. 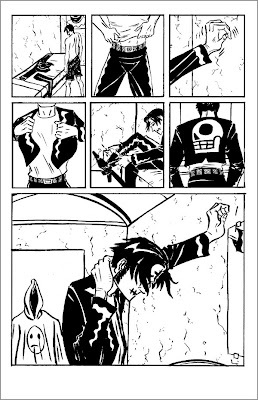 Just a way to fill up a page in KING SIZE EL MUERTO #1 , really. But over the years I kept going back to the idea. In 2004, I was teaching a Comic Book Workshop, and as an instructional aid, I had the students contribute to the plot of a comic and aid in the comic book storytelling. I would set up the scene and ask the students to come up with a ideas for the narrative. A couple of the girls came up with the idea of 'Ducky'! I drew the pages during two class sessions, using the same markers as the students, so as to encourage them in finishing their comics. 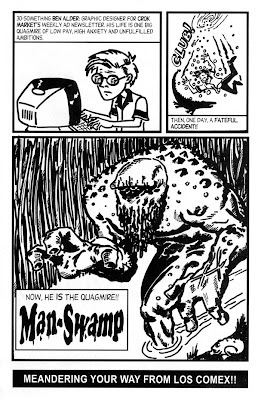 So this is the first appearance of Man-Swamp in a comic, I guess! 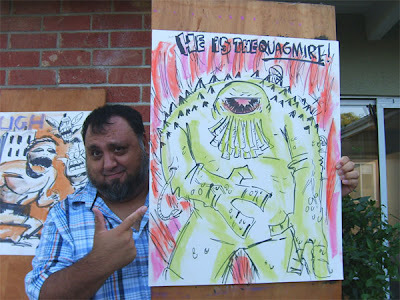 But when I was invited to join the Mini Comics Dumptruck, I immediately thought of bringing back Bog Breath back for a proper comic book story. 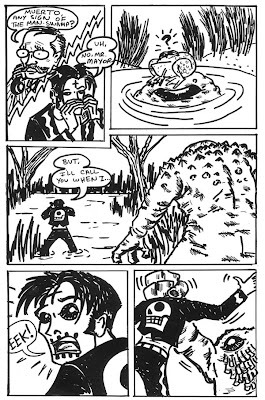 I've actually fleshed out a more involved back story for the character, so the Man-Swamp mini comic will actually be more than just a gag story. But of course, with a name like he's got, this is still a freaky, whacked-out idea! Here's a sketch I did a week or so back. Once I get started on the actual mini (sometime in December), I'll post some more updates. MAN-SWAMP ™and © 2008 Javier Hernandez. All Rights Reserved. Rhode Montijo today on PCBR! 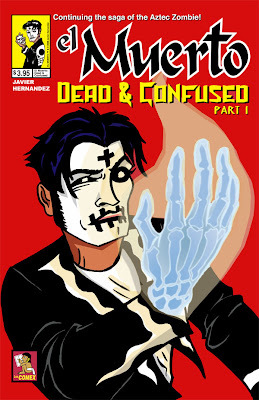 EL MUERTO:DEAD & CONFUSED off to the printers! 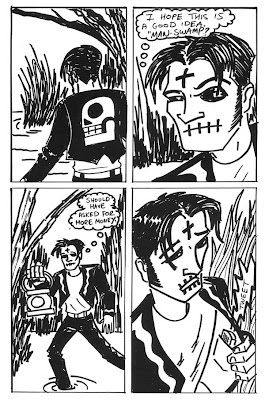 There's a new EL MUERTO comic book on the way! I just sent the files off to the printers over the weekend. It's the first time I'm using a POD (Print On Demand) service, so it'll be interesting to see how the whole experience plays out! 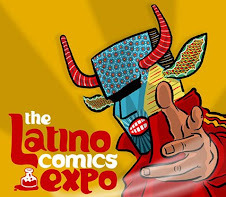 This book will debut at the Alternative Press Expo this coming November 1 and 2 in San Francisco. 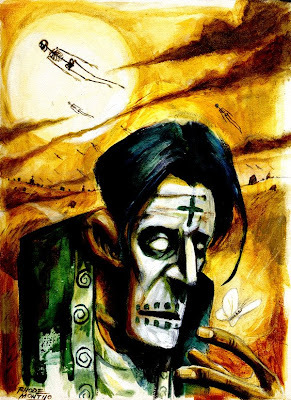 This marks my 10th straight year as an exhibitor at APE, and in fact I debuted El Muerto at APE back in 1998, so this is a real special celebration for me. In the meantime, here's a couple more pages from DEAD AND CONFUSED. I'll be writing here about some more behind-the-scenes insight into this book, with a few more images to share. 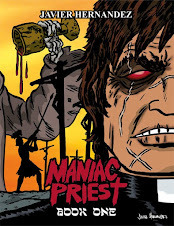 El Muerto is back! Last night's debut podcast was as much fun as I hoped it would be. 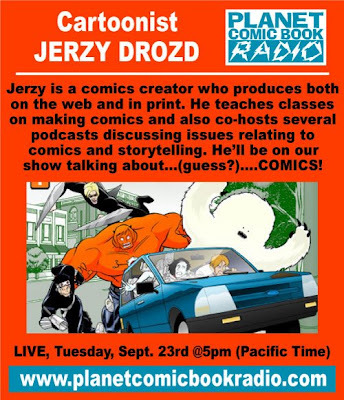 I had 5 other cartoonists joining me on the phone, so we covered a good variety of topics (well, all comic-related, of course!). Check out the JAVILAND Blog for the show notes and the actual podcast!